Dendritic cells (DCs) are the only APCs capable of initiating adaptive immune responses. The initiation of immune responses requires that DCs 1) internalize and present Ags; and 2) undergo a differentiation process, called “maturation”, which transforms DCs into efficient APCs. DC maturation may be initiated by the engagement of different surface receptors, including certain cytokine receptors (such as TNFR), Toll-like receptors, CD40, and FcRs. The early activation events that link receptor engagement and DC maturation are not well characterized. We found that FcR engagement by immune complexes induced the phosphorylation of Syk, a protein tyrosine kinase acting immediately downstream of FcRs. Syk was dispensable for DC differentiation in vitro and in vivo, but was strictly required for immune complexes internalization and subsequent Ag presentation to T lymphocytes. Importantly, Syk was also required for the induction of DC maturation and IL-12 production after FcR engagement, but not after engagement of other surface receptors, such as TNFR or Toll-like receptors. Therefore, protein tyrosine phosphorylation by Syk represents a novel pathway for the induction of DC maturation. Dendritic cells (DCs)3 play a key role in the control of immune responses (1, 2). Immature DCs take up Ags in peripheral tissues, degrade them into peptides, and load these peptides on MHC class I and II molecules. DCs then migrate to the lymph nodes to interact with CD4+ and CD8+ T lymphocytes. To complete this process, DCs need to undergo a developmental program, called maturation, that controls their capacity to generate the MHC-peptide complexes, their migration toward lymph nodes, and their ability to stimulate T lymphocytes (1, 3). Immature DCs capture Ags by fluid-phase uptake (macropinocytosis) or receptor-mediated internalization (endocytosis and phagocytosis) (3). DCs express different receptors involved in Ag internalization, such as lectin type receptors (mannose receptor, DEC205), viral receptors (CD46), integrins and other receptors for apoptotic bodies (α5β5, α5β3, CD36), complement receptors for opsonins, FcRs (FcγR, FcαR, and FcεR, which binds, respectively, IgG, IgA, and IgE). These receptors mediate efficient Ag uptake and strongly enhance the efficiency of Ag presentation to T cells. After Ag uptake, DCs present processed antigenic peptides to both MHC class II-restricted CD4+ T cells and to class I-restricted CD8+ T cells. Although peptides presented on MHC class I molecules are generally derived from cytosolic Ags, DC also “cross-present” peptides from exogenous Ags to MHC class-I restricted CD8+ T cells (3). Cross-presentation is particularly efficient when Ag is expressed in bacteria, linked to synthetic beads, expressed in apoptotic bodies, or bound to Abs (immune complexes; ICs) (1, 2). However, Ag internalization is not sufficient to initiate immune responses. An additional signal is also required which turns on innate immunity and triggers DC maturation (4). The outcome of the DC-T cell interactions depends on the maturation of the DC. Whereas fully mature DCs prime immune responses, immature DCs may induce tolerance (5). Therefore, DC maturation critically influences the outcome of immune responses. The maturation process has been analyzed in some details in the last decade (1, 3). Induction of maturation results in a marked decrease in internalization efficacy. Mature DC also strongly up-regulate surface expression of MHC and costimulatory molecules (including CD80, CD86, and CD40). Maturation induces cytokine production and modifies surface expression of adhesion molecules and chemokine receptors. Thus, during maturation, DCs become incompetent for Ag internalization and processing, and competent for T cell stimulation while they migrate out of the tissues and reach the lymph nodes. DC maturation can be induced by both direct (pathogen compounds) and indirect signals which are part of immune responses against the pathogen (6). Direct signals include bacterial proteins (such as superantigens and toxins), bacterial endotoxins (such as LPS), bacterial DNA (through CpG-containing motifs), and viral dsRNA. Indirect signals include proinflammatory cytokines (such as TNF-α, IL-1α/IL-1β), intracellular compounds secreted during necrosis, ICs, and signals from CD4+ T cells. The DC receptors involved in the induction of maturation were identified in some cases. Toll-like receptors (TLRs) are involved in the response to most pathogen compounds (7). Cytokines act through their corresponding receptors and T cells induce maturation through CD40-dependent (8) and -independent pathways (9, 10). ICs induce DC maturation through FcRs expressed by DCs (see below) (11). Although very little is known about the early activation signals that initiate DC maturation, some of the later activation events have been analyzed. Exposure of DC to LPS induces activation of mitogen-activated protein kinase (MAPK) (extracellular signal-regulated kinase (Erk)1/2, p38), phosphoinositide 3 kinase, and NF-κB transcription factor (12, 13), but LPS-induced DC maturation is not dependent on the Erk1/2 pathway (12). Moreover, in human DC, CD40 ligation leads to recruitment of TNFR-associated factor 3 and TNFR-associated factor 2, protein tyrosine phosphorylation, as well as MAPK (Erk1/2, p38, and c-Jun N-terminal kinase 1/2) and NF-κB activation (14, 15). The pathways linking receptor engagement to these late activation events in DCs have been analyzed in the case of TLR. The roles of MyD88/IL-1R-associated kinase and TIR domain-containing adaptor protein/protein kinase RNA-regulated in the induction of DC maturation by TLR9 and TLR4, respectively, have been reported (7). In this study, we analyze the early signaling events involved in FcγR-mediated Ag presentation and induction of DC maturation. We have previously demonstrated that induction of DC maturation through FcγRs requires the FcR-associated γ-chain (11). The γ-chain bears an immunoreceptor tyrosine-based activation motif (ITAM), which determines internalization and activation through type I (CD64) and type III (CD16) FcγRs. Upon receptor engagement, this motif is phosphorylated by src family protein tyrosine kinases (PTKs). Another family of PTKs, Zap70/Syk, are then recruited to and activated by the phosphorylated ITAMs (16). Zap70 is expressed in T cells, while Syk is expressed in B lymphocytes, macrophages, and a subset of T cells. Both Zap70 and Syk play a crucial role in lymphocyte signal transduction: T cells fail to develop in Zap−/−-deficient mice, while Syk is required for B cell development (17). Syk is also required for efficient activation and internalization through BcRs and FcγRs in B cells (18, 19). In macrophages, Syk plays a critical role in FcγR-mediated phagocytosis (20, 21). Using irradiated recombination-activating gene (RAG)2−/− common cytokine receptor γ-chain−/− double mutant mice reconstituted with Syk−/− fetal liver cells, we successfully generated Syk-deficient immature bone marrow-derived DCs (BM-DCs). We showed that Zap70 is not expressed in DCs from normal or Syk-deficient mice. Thus, we demonstrated that Syk is required for the uptake of ICs and for their Ag presentation in DCs. Furthermore, Syk is indispensable for the induction of maturation by ICs, but not by LPS, CpG DNA, or TNF-α. Our data indicate that Syk controls both up-regulation of surface molecules and cytokine synthesis. These results demonstrate that protein phosphorylation may initiate the process of DC maturation after FcR engagement, thus defining a novel signaling pathway for the induction of DC maturation. C57BL/6 were purchased from Iffa Credo (L’Arbresle, France). FcγR type I−/− and γ-chain−/− mice were on a B6 × 129 background (11). Generation of the chimeras was previously described (22), briefly mice heterozygous for the Syktm1Tyb mutation (into the kinase domain) back-crossed onto a B10.D2 background (H-2d haplotype) were intercrossed to generate Syk−/− and control (Syk+/+ or Syk+/−) embryos (23). Mice doubly deficient in RAG2 and common γ-chain (H-2b) were irradiated (300 rad) and were injected i.v. with 5 × 106 Syk-deficient or control fetal liver cells to generate either Syk−/− or wild-type (wt) chimeras. Epidermis from ear skin was separated from dermis by incubation with ammonium thiocyanate. Resulting sheets were fixed in acetone for 20 min at room temperature, rinsed in PBS, and then labeled with the procedure mentioned below. Spleen cells suspensions were prepared initially by collagenase D/DNase I (Boehringer Mannheim, Indianapolis, IN) digestion and then stained for flow cytometry analysis. After lysing RBCs, bone marrow cells were cultured during 14–21 days in IMDM (Sigma-Aldrich, St. Louis, MO) containing 10% heat-inactivated FCS (Biowest, Nuailles, France), 100 IU/ml penicillin, 100 mg/ml streptomycin (Life Technologies, Cergy Pontoise, France), 2 mM l-glutamine, and 50 mM 2-ME with 30% conditioned medium from GM-CSF-producing J558 cells (kindly given by D. Gray, University of Edinburgh, Edinburgh, U.K.). Cells were used when >90% CD11c+ and <10% granulocytes GR1+ were obtained. Immature phenotype of BM-DCs in culture was frequently checked by FACS analysis and their ability to mature was confirmed by addition of LPS (from Salmonella typhimurium; Sigma-Ald-rich) during 24 or 48 h. D1 long-term cultured cell line was also cultured in the same conditions (24). Bacterial petri dishes were coated 2 h at 37°C with 30 μg/ml anti-HRP rabbit polyclonal Ab (ICN Pharmaceuticals, Costa Mesa, CA) pretreated with Kuttsuclean (Maruha, Ibaraki, Japan) to eliminate endotoxins eventually present in the commercial Ab solution. A total of 0.5.106/2 ml BM-DCs were added to the coated plates or cultured in the presence of the same anti-HRP Ab under soluble form as a negative control. Various other stimuli were used to treat the BM-DC for 48 h: 20 μg/ml LPS, 30 ng/ml TNF-α (R&D Systems, Minneapolis, MN), 1 μg/ml oligodeoxynucleotides (ODN) (either containing CpG motifs 1826 or non-CpG DNA 1982) kindly given by Dr. R. Lo-Man (Pasteur Institute, Paris, France). From these samples, IL-12p40 contents were measured in the supernatants using ELISA (OptEIA kit; BD PharMingen, San Diego, CA) according to the manufacturer’s instructions. From the same samples, cells were recovered and labeled for FACS analysis. Cells were resuspended in PBS containing 3% FCS and 0.05% azide. mAbs directly conjugated to fluorochrome (BD PharMingen) were used to stain the cells: anti-CD11c (HL3), anti-MHC class II H2b (I-Ab AF6-120.1), anti-MHC class II H2d (I-Ad AMS-32.1), anti-B7-2 (GL1), anti-CD40 (3/23), and anti-FcγRII/III (2.4G2). Anti-FcγRI was kindly provided by P. M. Hogarth (Austin Research Institute, Victoria, Australia) and revealed with the appropriate secondary Ab. For triple labeling on spleen cells, anti-B7-1 (16-10A1) and anti-CD40 were used biotinylated followed by streptavidin-FITC (Immunotech, Luminy, France). The analysis was performed on gated CD11c+highIAd+ cells. Appropriate isotypic controls were always used as the background staining. FACS analysis was performed with a FACSCalibur and the CellQuest software (BD Biosciences, Mountain View, CA). Fixed epidermal sheets were incubated with biotinylated anti-IAd (MKD6) and anti-IAb-FITC (AF6-120.1) Abs diluted in PBS-0.5% BSA. After several washes in PBS-0.5% BSA, streptavidin-Cy3 (kindly given by F. Geissmann, Hopital Necker, Paris, France) was added. After washes in PBS-0.5% BSA, immunolabeled specimens were mounted in Fluoromount (Southern Biotechnology Associates, Birmingham, AL). BM-DCs were allowed to adhere to glass slides coated with poly-l-lysine (Sigma-Aldrich) and then incubated during at least 1 h at 37°C in the presence of preformed rhodamine-labeled HRP/anti-HRP ICs (15 μg/ml Rho-HRP (Sigma-Aldrich) with 120 μg/ml rabbit polyclonal IgG anti-HRP incubated 30 min at 37°C). Cells were then washed in PBS, fixed with 4% paraformaldehyde, and labeled with wheat germ agglutinin directly conjugated to AlexaFluor488 (Molecular Probes, Eugene, OR) for 30 min without permeabilization of the cells. After washing, cells were mounted and analyzed by confocal microscopy using a Leica TCS SP2 microscope equipped with a ×100 1.4 NA HCX PL APO oil immersion objective (Leica, Deerfield, IL). To detect Syk or Zap70 expression, cells were lysed in RIPA buffer (Tris 20 mM, NaCl 140 mM, Nonidet P-40 0.5%, EDTA 2 mM, NaF 50 mM, SDS 0.1%, deoxycholic acid 0.5%) containing antiproteases and antiphosphatases (PMSF 1 mM, aprotinine 1%, pepstatine 1 μg/ml, antipain 1 μg/ml, leupeptine 1 μg/ml, Na3Vo4 1 mM) on ice during 20 min. Cell lysates were then separated on a standard 10% SDS-PAGE, transferred to polyvinylidene difluoride membranes (Millipore, Bedford, MA), and blotted with the appropriate Ab. For cell stimulation, D1 cells or BM-DC were incubated either alone in complete medium or in the presence of preformed HRP/anti-HRP ICs (preparation depicted above) or with pervanadate (0.1 mM orthovanadate + 0.3 mM H2O2), at 37°C during the indicated short times. Each sample was then rapidly washed with cold PBS and lysed in cold RIPA buffer. The same amount of protein from each sample were separated on a SDS-PAGE and blotted. The specific Abs used were anti-Syk (Santa Cruz Biotechnology, Santa Cruz, CA), anti-Zap70 (Transduction Laboratories, Lexington, KY), anti-Erk (Santa Cruz Biotechnology), or anti-phosphoErk1/2 (NEB, Beverly, MA) mAbs followed respectively by anti-rabbit or anti-mouse HRP-labeled secondary Abs (The Jackson Laboratory, Bar Harbor, ME). The same samples were used to perform immunoprecipitation. Lysates were precleared with nonimmune murine Igs, then incubated with 4G10 antiphosphotyrosine Ab overnight at 4°C followed by blotting with anti-Syk Ab. A total of 5.104 BM-DC were incubated with various concentrations of soluble OVA (Worthington Biochemical, Lakewood, NJ) or OVA complexed to specific Abs (OVA-ICs) (50 μg/ml anti-OVA IgG purified from rabbit sera (Sigma-Aldrich) mixed with various concentrations of OVA protein as mentioned on the figure) and 5 × 104 class II-restricted CD4+ T cell hybridoma. We used BO97.10 (I-Ad restricted) (kindly given by J. C. Guéry, Institut National de la Santé et de la Recherche Medicale Unité 563, Toulouse, France) and DO11.10 (IAb restricted) which are both specific for the class II immunodominant 323–339 OVA peptide. After 24 h, 50 μl of supernatants were harvested and the IL-2 production by T cells was measured with [3H]thymidine incorporation by the IL-2-dependent CTLL2 cell line. Very little is known about the early signaling events implicated in DCs differentiation and maturation. Our previous results showed that FcγR engagement induces DC maturation and the FcR-associated γ-chain is indispensable for this effect (11). The γ-chain bears an ITAM, a motif that recruits and activates tyrosine kinases after tyrosine phosphorylation. Therefore, our results suggested that activation of tyrosine kinases may represent a pathway for the initiation of DC maturation. To test this possibility, we focused our attention on Syk, a PTK recruited on phosphorylated ITAMs after FcR engagement in other cell types (16). Mice deficient for Syk die in utero, or prenatally from excessive hemorrhage. To overcome this problem, we used irradiated alymphoid mice (H-2b haplotype), containing RAG2 and common γ-chain double mutations reconstituted using normal (wt) or Syk-deficient (Syk−/−) fetal liver cells (H-2d haplotype). As previously reported in detail (22, 25), the resulting Syk−/− chimeras exhibit no mature B lymphocytes, but generate T lymphocytes, NK cells, and macrophages. We first analyzed the role of Syk in the differentiation of DCs in vivo. Immunofluorescence staining on epidermal sheets from the ears of chimeric mice showed that H-2d+ Langerhans cells were detected in wt or Syk−/− mice (Fig. 1⇓A). Obviously, Langerhans cells from the recipient host were present also in wt or Syk−/− ears as detected by anti-I-Ab-specific labeling (data not shown). Surprisingly, we generally did not observe H-2d+ and H-2b+ Langerhans cells in the same area of the tissue, but rather at separate locations. We also analyzed DCs in the spleen of the chimeras by FACS. The percentage of CD11c+ cells was similar in wt or Syk−/− splenocytes, 3.8 and 3.65%, respectively. 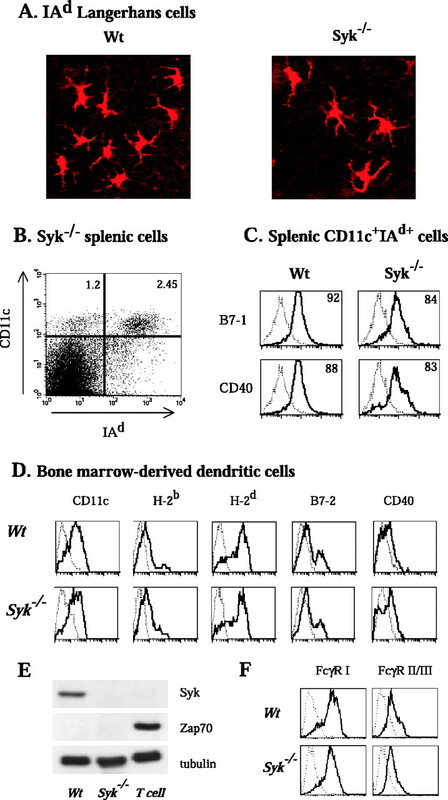 Among these CD11c+ cells, equivalent proportion of I-Ad+ cells were represented indicating the efficient reconstitution of the irradiated recipient mice (data shown for Syk−/− spleen cells in Fig. 1⇓B and similar for wt cells). The CD11c+highIAd+ gated DCs from Syk−/− or wt chimeras exhibited similar profiles of B7-1, B7-2, and CD40 surface expressions (Fig. 1⇓C and data not shown). Normal in vivo and in vitro differentiation of DCs in Syk-deficient mice. A, Epidermal sheets from ear from wt or Syk−/− chimeric mice were stained for anti-MHC class II IAd molecules and observed by confocal microscopy. In both cases, Langerhans cells from the H-2b recipient mouse were detected by anti-IAb Ab (data not shown). B and C, Splenocytes from wt or Syk−/− chimeras were subjected to triple labeling for CD11c, IAd, and B7-1 or CD40 followed by FACS analysis. Dot plot on Syk−/− total spleen cells was represented in B. B7-1 and CD40 expression was represented on CD11c+highIAd+-gated cells for wt and Syk−/− spleen cells (dark lines). The percentage of positive cells was mentioned for each histogram. Isotypic controls were shown as negative controls (thin lines). D and E, Bone marrow cells from mouse chimera reconstituted with either normal (wt) or Syk-deficient (Syk−/−) fetal liver cells were cultured as described in Materials and Methods. D, These BM-DCs were characterized by staining with anti-CD11c, anti-MHC class II H2b (I-Ab), anti-MHC class II H2d (I-Ad), anti-B7-2, or anti-CD40 Abs followed by FACS analysis (thick lines). Isotypic controls were shown as negative controls (thin lines). These cells did not express any more granulocytes specific marker (GR1) (data not shown). E, wt and Syk−/− BM-DC lysates were run on SDS-PAGE and blotted with anti-Syk, anti-Zap70, or anti-tubulin. B3Z CD8+ T cell hybridoma was used as a positive control for Zap70 expression. F, The expression of FcγRs was detected on Wt or Syk−/− BM-DCs by labeling these cells with anti-FcγRII/III or anti-FcγRI Abs. Isotypic controls were shown as negative controls (thin lines). Bone marrow precursor cells from these chimeras were cultured in the presence of GM-CSF. The resulting cells expressed an immature DC phenotype, including high levels of CD11c and low levels of B7-2 and CD40 (Fig. 1⇑D). Syk−/− DC preparations generally contained fewer mature cells than wt DC preparations (lower than 5% vs 10–20%). Over 90% of the cells also expressed H-2d MHC class I and II, attesting that they have developed from donor and not from host precursors. Indeed, Syk was not detected by Western blot in the Syk−/− DCs, while DCs generated from mice reconstituted with wt fetal liver (wt DC) expressed Syk abundantly (Fig. 1⇑E). In addition, DCs did not express the Zap70 protein, indicating that Syk is the only tyrosine kinase from this family expressed in normal DCs. Collectively, these results indicate that Syk is not necessary for normal development of DCs in vivo or in vitro. To evaluate the role of Syk in DC effector functions, we first analyzed MHC class II-restricted Ag presentation. We have shown previously that after FcγR-mediated uptake, DCs present Ag very efficiently to both CD4+, MHC class II-restricted helper T cells, and to CD8+, MHC class I-restricted CTLs (11, 26). wt BMDC express the three types of FcγR: FcγRI, FcγRIIB, and FcγRIII as detected by FACS (Fig. 1⇑F) and biochemical analysis (11). These FcγRs were detected at similar levels in wt and Syk−/− DC which indicates that Syk deficiency does not affect the balance between expression of activating FcγRI/III and inhibitory FcRγIIB. Fig. 2⇓A shows that wt and Syk−/− H-2d DCs stimulated very efficiently the CD4+ T cell hybridoma in the presence of soluble OVA. In contrast to wt DCs, Syk−/− DCs were unable to present OVA complexed to specific Abs (OVA-ICs) to CD4+ T cells. As expected, control DC generated from normal H-2b C57BL/6 mice stimulated the CD4+ T hybridoma in the presence of either soluble OVA or OVA-ICs while DCs generated from mice deficient for FcγR-associated γ-chain (FcRγ) were unable to present OVA-ICs to T cells (Fig. 2⇓B). The corresponding OVA peptides were presented to the two CD4+ T cell hybridomas by normal, Syk−/−, or FcRγ−/− DCs with similar efficiencies (data not shown). Therefore, Syk is required for efficient presentation of OVA-ICs, indicating that Syk is involved in the process of Ag uptake, processing, or presentation to T cells via FcγR. Syk−/− DCs are unable to present ICs to T cells and to internalize ICs. A and B, BM-DCs were plated in the presence of various concentrations of OVA protein under either soluble form or complexed to Abs (OVA-ICs). CD4 T cell hybridoma was added for 24 h of incubation and then supernatants were collected and tested for their IL-2 contents using CTLL-2 cell line. The same results for IL-2 production were obtained by anti-IL-2 sandwich ELISA (data not shown). A, wt or Syk−/− DCs were incubated with I-Ad-restricted BO97.10 cells; B, normal C57BL/6 or γ-chain−/− DCs were incubated with I-Ab-restricted DO11.10 cells. One representative experiment of four performed is shown. C, wt or Syk−/− BM-DCs were incubated with rhodamine-HRP/anti-HRP ICs for 1 h at 37°C, then washed in PBS, fixed in paraformaldehyde, and stained with wheat germ agglutinin-AlexaFluor488 without permeabilization of the cells to detect the surface plasma membrane. Cells were then analyzed by confocal microscopy and pictures taken in xy section (horizontal section) and in xz section (vertical section) on one zoomed cell to visualize clearly inside and outside of the cell. We first analyzed ICs internalization in DCs using confocal microscopy. DCs were incubated with rhodamine-labeled HRP/anti-HRP ICs for 1 h at 37°C and after fixation the cells were stained with fluorescent lectin to visualize the plasma membrane. As previously described, HRP-ICs were efficiently internalized in wt DCs and localized to intracellular vesicular compartments along the endocytic route (Fig. 2⇑C and Ref. 27). In contrast, Syk−/− DCs were unable to internalize HRP-ICs, even after 6 h of incubation, as shown by the absence of rhodamine labeling inside the cells (Fig. 2⇑C). In contrast to wt DCs, numerous aggregates of HRP-ICs were observed at the surface of the Syk−/− cells, (the z-axis panel in Fig. 2⇑C). Therefore, Syk is required for IC internalization in DCs. The role of Syk in internalization is restricted to FcR-mediated uptake, as Syk−/− DC internalized FITC-dextran and phagocytosed apoptotic cells normally (data not shown). We next analyzed the role of Syk in the induction of DCs maturation. We have previously shown that the FcR-associated γ-chain is required for the induction of DC maturation by ICs and that DCs express all isoforms of FcγRs, including FcγRI, FcγRII, and FcγRIII. In the experiment shown in Fig. 3⇓, immature DCs were stimulated by LPS or by Abs coated onto culture plates, an efficient way of cross-linking FcγRs. The same amount of soluble Ab added to cultures had no effect on DCs maturation, indicating that effects observed were not due to contaminating endotoxins (data not shown) (see Fig. 5⇓A). Both LPS and coated Abs efficiently induced DC maturation, as detected by the increased expression of B7.2 (Fig. 3⇓) and CD40 (data not shown). In γ-chain-deficient DCs, LPS induced maturation but coated Abs did not, showing that the γ-chain is required for FcγR-mediated DC activation. In cells deficient for FcγRI, both LPS and coated Abs induced maturation. Similar results were obtained with FcγRIII−/− DCs (data not shown), suggesting that the presence of either FcγRI or FcγRIII was sufficient for the induction of DC activation through FcγRs. Induction of DCs maturation via cross-linking of FcγR is not restricted to FcγR type I but requires γ-chain. C57BL/6, FcγR type I−/−, or γ-chain−/− BM-DCs were cultured either in normal medium or with LPS (20 μg/ml) or in anti-HRP-coated petri dishes (30 μg/ml). After 48 h, cells were stained for B7-2 (CD86) (dark line) compared with the isotypic control (thin line) and analyzed by FACS. The same modulations were obtained for CD40 surface expression (data not shown). To analyze the early activation events after FcγR engagement, DCs were incubated either alone or with preformed anti-HRP/HRP ICs at 37°C for various periods of time. 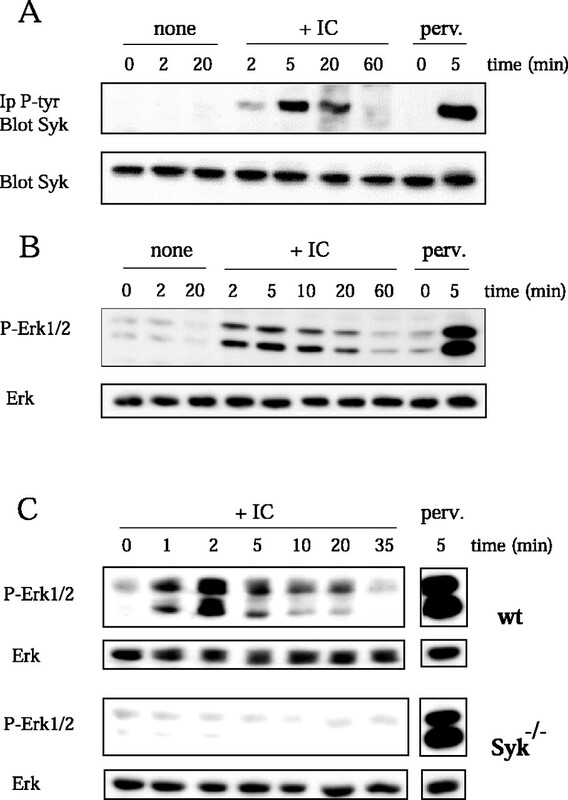 The phosphorylation of Syk and Erk1/2 was then analyzed by Western blot. Syk phosphorylation was detected as soon as 2 min after the addition of ICs, with a maximum at 5 min, and dephosphorylation after 1 h of stimulation (Fig. 4⇓A). Total Syk protein was detected in equivalent amount in all the samples. Early phosphorylation of Erk1/Erk2 MAPKs was also detected in D1 cells as well as in wt BM-DCs (Fig. 4⇓, B and C). In contrast, FcγR-induced phosphorylation of Erk1/2 was not observed in Syk−/− DC (Fig. 4⇓C). Therefore, activation of DCs via FcγR led to phosphorylation (and activation) of Syk tyrosine kinase, which is required for Erk1/2 phosphorylation. Phosphorylation of Syk during FcγR-induced activation of DCs. DCs were incubated without (none) or with preformed HRP-IC (+IC) or with pervanadate (a potent nonspecific inhibitor of tyrosine phosphatases) during the indicated times. A, Treated D1 cells were lysed and immunoprecipitated with antiphosphotyrosine Ab followed by anti-Syk immunoblotting. The same cell lysates were directly blotted with anti-Syk Ab to quantify the total amount of Syk in each sample. 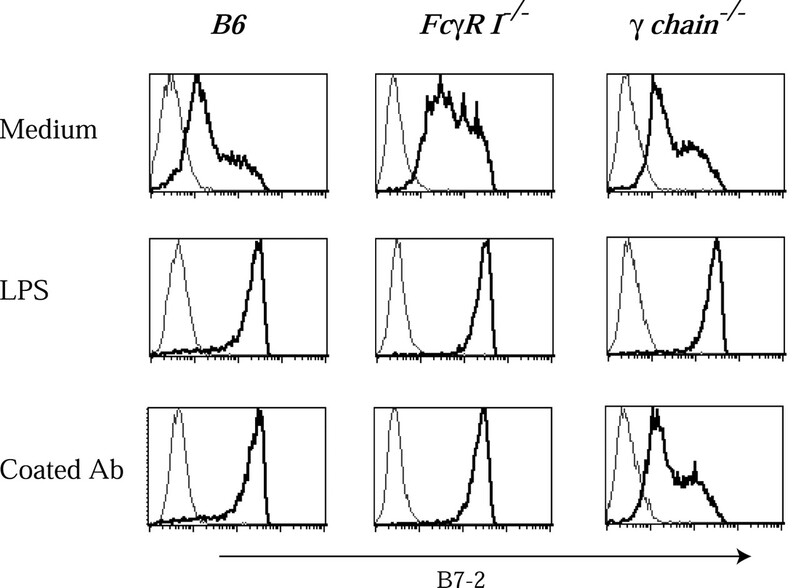 B, The same D1 cell lysates were blotted with antiphosphorylated Erk1/2 Ab to follow the kinetic of DCs activation and then with anti-Erk to compare the amount of total Erk in each sample. C, wt or Syk−/− BM-DCs incubated in similar conditions were lysed and directly blotted with anti-phosphorylated Erk1/2 Ab or with anti-Erk Ab. Erk1/2 are also phosphorylated upon induction of DC maturation by LPS. Therefore, we investigated the role of Syk on the activation process of DCs. wt or Syk−/− DCs were stimulated with either LPS or coated Abs and the expression of B7-2 and CD40 was analyzed by FACS. As shown in Fig. 5⇓A, B7-2 and CD40 surface expression were strongly increased in wt DCs treated with LPS or incubated in Ab-coated plates. 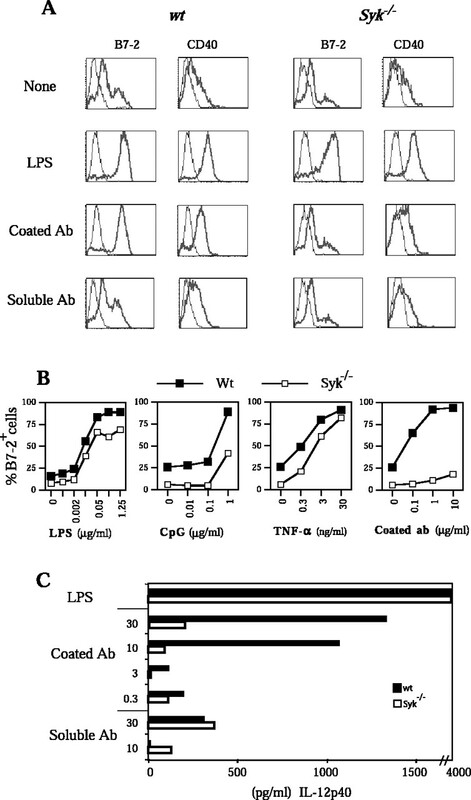 Syk−/− DCs were still efficiently activated through LPS, but the cross-linking of FcγR did not induce any changes in the expression of B7-2 and CD40. Similar results were obtained when the expression of MHC class II was monitored (data not shown). Inhibition of DC maturation and IL-12 production in the absence of Syk. A, wt or Syk−/− BM-DCs were incubated either alone or with LPS or in anti-HRP-coated plates or with the soluble anti-HRP for 48 h. Then, cells were recovered and stained for B7-2 or CD40 surface expression followed by FACS analysis. Anti-HRP Ab was used at 30 μg/ml. B, wt or Syk−/− BM-DCs were incubated with various doses of activators for 48 h and B7-2 surface expression was detected by FACS. Data represented the percentage of B7-2high to compare the percentage of mature DC in the different conditions (dark lines). Isotypic controls were shown as negative controls (thin lines). C, After treatment of wt or Syk−/− BM-DCs with LPS or in anti-HRP-coated plates (decreasing doses of coated Ab, from 30 to 0.3 μg/ml) or with the soluble anti-HRP (30 and 10 μg/ml), supernatants were tested for their IL-12p40 content by ELISA, in comparison to IL-12 recombinant standard. One experiment representative of three (B and C) or four (A) performed is shown. We then analyzed if Syk could be involved in the induction of DC maturation by other receptor-mediated pathways, implicating TLRs (TLR4 or TLR9) or TNFRs. DCs were treated with various concentrations of LPS, CpG ODN, and TNF-α or incubated on plates coated with various concentrations of Ab. As shown in Fig. 5⇑B, LPS, CpG ODN, and TNF-α induced increased expression of B7-2 and CD40 at similar levels in wt and Syk−/− DCs. As mentioned before, we reproducibly found that the percentage of mature cells in the DC preparations was slightly lower in the Syk−/− DCs, as compared with wt DCs. Moreover, these results indicated that wt and Syk-deficient DCs exhibited equivalent sensitivity to the different activators. Therefore, Syk is selectively involved in FcγR-mediated induction of DC maturation. IL-12 plays a critical role in the initiation of immune responses by DCs. IL-12 production in DCs is induced upon maturation by microbial products and CD40 ligand. It was shown previously that IL-12 production is also induced by ICs in DCs (28). Both wt and Syk−/− DC secreted similar high levels of IL-12p40 in response to LPS treatment (Fig. 5⇑C). wt DCs also produced IL-12 after FcγR cross-linking. In contrast, IL-12 production after FcγR activation was completely abolished in Syk−/− DCs. The p70 bioactive form of IL-12 is generated by the association of two subunits, p40 and p35. However, in our assays, IL-12p70 detection was low and irreproducible. We conclude that Syk is required for the induction of DC maturation by ICs. This study aimed at determining the link between early signaling events activated after receptor engagement and the induction of DC maturation. We investigated the role of the proximal PTK Zap70/Syk on DC differentiation and maturation. We first demonstrated that normal DCs express only Syk, and that neither wt nor Syk−/− DCs express Zap70. We also show that Syk/Zap70 is not necessary for DC differentiation, in contrast to T or B lymphocytes, for which normal development requires Zap70 and Syk, respectively. NK cells, macrophages, granulocytes, and eosinophils also develop normally in the absence of the tyrosine kinases from this family, although their FcγR-mediated functions are defective (17, 22, 25). We show that Syk plays an essential role in the two main FcγR functions in differentiated DCs: Ag internalization and induction of maturation. The role of Syk was also extremely selective for FcγR functions since induction of maturation through TLRs or TNF-α receptor or internalization of apoptotic cells or dextran were not affected by the absence of Syk. Therefore, stimulation of PTK activity may initiate a signaling cascade that results in full DC activation. The signal transduction pathway triggered by FcγR has been studied in details in other cell types. src family PTKs phosphorylate ITAMs on the FcγR-associated γ-chain, leading to the activation of Syk proximal tyrosine kinase, which is in turn autoactivated (16). Phosphorylated Syk then recruits and activates different downstream effectors, such as MAPKs, phospholipase A, phospholipase Cγ, PKC, serine/threonine kinases, phosphoinositide 3-kinase, small GTPAses (Rac1 and Cdc42), which consequently induce the transcription of genes involved in DCs function and maturation. In this study, we show that Syk is phosphorylated after FcγR cross-linking and triggers Erk1/2 phosphorylation. Indeed, Erk1/2 was no longer activated in Syk−/− DCs, as compared with wt DCs (Fig. 4⇑C), establishing a direct link between Syk and Erk signaling pathways (as previously suggested for CD40 activation of DC) (15). The process of DC maturation determines the capacity of DCs to prime T cells and to polarize T cell differentiation toward Th1 or Th2 responses. For example, the cytokines produced by DCs in response to LPS or dsRNA lead to Th1 polarization, whereas TNF-α stimulation of DCs does not produce clear Th1/Th2 polarization (28, 29). Th polarization by DCs most likely results from the induction by different DC activators of the production of a different set of secreted cytokines. The production of IL-12 by activated DCs has been linked to polarization of the Th responses toward Th1. FcγR engagement induces IL-12 production, and has also been shown to effectively prime CTL responses in vivo (30), suggesting that DC activation by ICs would result in Th1 polarization. In contrast, macrophages were recently reported to reverse a Th1-like response toward a Th2-like phenotype when Ag was targeted on FcγR (31). The signaling pathways activated during DC maturation leading to the secretion of different cytokines are still unclear. Interestingly, both surface marker up-regulation and IL-12 production were abrogated in the absence of Syk, showing that activation of tyrosine phosphorylation activates the signaling pathways responsible for both readouts of DC maturation. Similar to FcγR-mediated DC activation, Syk phosphorylation was also reported after CD40 ligation in human DC (15). However, we could not get a clear picture concerning the role of Syk, in CD40 ligand-induced DC maturation; depending on the activating anti-CD40 Abs used, the requirement for Syk varied (data not shown). In addition, preliminary results suggested that Syk is not strictly required for DC maturation after Ag-specific interaction with CD4+ T lymphocytes (our unpublished observations). DC-expressed FcγRs promote Ag presentation via internalization of ICs. We have shown previously that Syk is not involved in endocytosis of FcγRs in B lymphocytes, but that is required for the transfer of internalized ligands from endosomes to lysosomes (19). 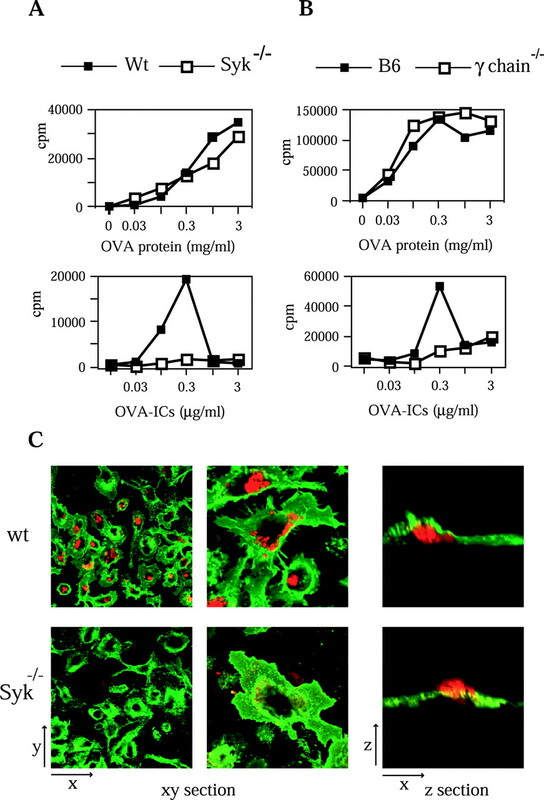 In contrast, Syk is necessary for efficient ICs internalization in DCs and macrophages (Fig. 2⇑C) (20, 21). The reasons for this discrepancy are unclear. It might result from residual Syk activity in B cells expressing dominant-negative Syk, in contrast to the complete lack of Syk in the Syk−/− DCs or macrophages. Cell type differences between phagocytic (macrophages and DCs) and nonphagocytic cells (B lymphocytes) may also be involved. Our results suggest that activation of protein tyrosine phosphorylation is required for efficient FcγR internalization in phagocytic cells, but not in B lymphocytes. The nature of the FcγR involved in Ag internalization in DCs is also not fully understood. Mouse DCs express all FcγR isoforms (I, IIb1, IIb2, and III). The most abundant FcγRII isoform is FcγRIIb1, a nonendocytic FcγR (32). Despite this, ICs were efficiently internalized. In human DCs, FcγR targeting of Ags resulted in efficient internalization and subsequent Ag presentation to both CD4+ and CD8+ T cells. Nevertheless, the nature of the FcγRs specifically involved was not directly addressed. Like FcγR in mouse DCs, FcαR engagement in human DCs induces efficient maturation (33). By contrast, it was recently shown that human monocyte-derived DCs were not induced to mature after FcγR engagement (34, 35). However, our preliminary results suggest that FcγR engagement in human DCs induces, at least to some degree, DC maturation (our unpublished observations). These discrepancies may arise from the heterogeneous expression of activation (FcγRI, FcγRIIA, and FcγRIII) and inhibitory FcγRs (FcγRIIB) in different DC populations. It is most likely that like for other FcγR functions, simultaneous engagement of activation and inhibitory FcγRs inhibits activation as shown using FcγRIIB-deficient DCs (36). Nevertheless, in normal or Syk−/− mice-derived DCs which express both FcγRI/III and FcγRIIB, ICs induce efficient maturation (Fig. 3⇑ and Ref. 30). This is also the case in DCs derived from FcγRI- or FcγRIII-deficient mice, indicating that the balance toward activation could not be shifted by the absence of expression of one of the two activation receptors. ICs loaded on DCs could induce in vivo CD4+ and CD8+ CTL responses and mediate full tumor protection (30, 37) correlated with induction of DC maturation. Syk-deficient DCs could not signal through the γ-chain-dependent activating FcγRs (type I and III), but FcγRIIB signaling (i.e., the recruitment of SHIP phosphatase; Ref. 38) should be normal. A predominant inhibitory effect of FcγRIIB on tumor immunity and DC maturation has been suggested to induce tolerogenic DCs (36). However, another study showed that FcγR engagement in DCs FcγRI/II/III+ induces maturation and protective antitumor immune responses (37). These different studies have used DCs generated in vitro using slightly different protocols, which may account for the observed discrepancies. If indeed the balance in the expression of activation and inhibitory isoforms is determinant for the outcome of FcγRs engagement in DCs (which remains to be addressed), this may turn out to be important in autoimmunity. Indeed, the maturation state of DCs having internalized Ags is critical for the induction of immune responses: mature DCs induce T cell priming, whereas immature DC are probably involved in the induction of T cell tolerance (5). In situations when high amounts of autoantigen-containing ICs are generated, the selective expression of activation or inhibitory FcγR isoforms in DCs may help maintain peripheral tolerance, or on the contrary, may contribute to the induction of autoimmunity. We thank W. Faigle and N. Blanchard for their skillful advice in confocal microscopy and B. Asli and F. Geissmann for their technical help concerning the Langerhans cells analysis. 1 This work was supported by grants from Institut National de la Santé et de la Recherche Médicale, Centre National de la Recherche Scientifique, and Ligue Nationale contre le Cancer. C.S. is funded on grants from the European Union Contract N.BMH4-CT 98-3703. ↵3 Abbreviations used in this paper: DC, dendritic cell; BM-DC, bone marrow-derived DC; IC, immune complex; PTK, protein tyrosine kinase; TLR, Toll-like receptor; MAPK, mitogen-activated protein kinase; Erk, extracellular signal-regulated kinase; ITAM, immunoreceptor tyrosine-based activation motif; RAG, recombination-activating gene; wt, wild type; ODN, oligodeoxynucleotide.